If you are visiting this page because someone close to you has died, we are sorry for your loss. We hope this guide will inform and help you in arranging a funeral and many of the things you may have to think about at this time. This page tells you about many of the practical tasks, services and goods to consider when you are arranging a funeral. Clicking on the highlighted links will take you through to further reading about many of the topics we talk about. Once you’ve begun the process of arranging a funeral, our guide to planning a funeral service has useful information to help you plan the ceremony or celebration of life service itself. An established and experienced funeral director can help unburden you from much of the stress of arranging a funeral, so you can focus on the things that are most important to you. A good funeral director’s priority is to listen and support the bereaved, carry out their wishes and guide them through any complicated steps they may have to take. Whether you want a full traditional funeral, a green burial, a unique celebration of life or something low-key, a good funeral director can help. Just like families, every funeral home is unique, so you may find it helpful to compare funeral directors to find the funeral home that’s ideal for you and your family. As a further help, many top-rated funeral homes on Funeral Zone have been reviewed by bereaved families who have used their services. Anyone can arrange a funeral with a funeral director, regardless if they’re a family member or not. In most cases, this responsibility is usually taken by the spouse or a close family member. Many funerals directors can also help families who wish to arrange their loved one’s funeral independently, with any of the elements they need support with, such as funeral transportation or preparing someone for their funeral. Good funeral homes are on call 24 hours a day, around the year. They are experienced at listening to people at a very difficult time and can help guide newly-bereaved people through the steps they have to take. Before a funeral director can begin arranging a funeral, they will need certain information about your loved one. A funeral cannot be held before registering the person’s death, something most usually done by a relative, but part of a funeral director’s role is to undertake other paperwork involved in arranging a cremation or burial. Many people believe that a funeral is an important first step in coming to terms with the loss of someone and grieving for the person who has died. A good funeral director aims to ensure that the funeral arrangements enable families to focus on their loss, whether they choose to remember the person who has died with a celebration of their life, or choose a service that reflects the sadness of their loss. Some people are aware of what their loved one would have wanted, such as cremation, for instance, or a green burial. They may have left a funeral wish-list, in a written document or will, about their funeral choices. There is no legal obligation to carry out spoken or written funeral wishes if it is difficult to do so. Many people take personal comfort in fulfilling a funeral wish for the person who has died, no matter how small. If your loved one had a life insurance policy or funeral plan they may have already arranged and paid for many of the important elements of their funeral with a local funeral director. You may already know about a funeral plan they had, or they may have left details about it in their will. Bank statements might also provide clues about funeral plan payments someone made. Industry regulator The Funeral Planning Authority has a helpful search tool for tracing funeral plans that were taken out with registered providers. It also provides information about how to begin making arrangements when you have a funeral plan in place. How soon after someone dies does the funeral happen? In some cases, a person’s religious faith will determine how soon after their death the funeral must take place. 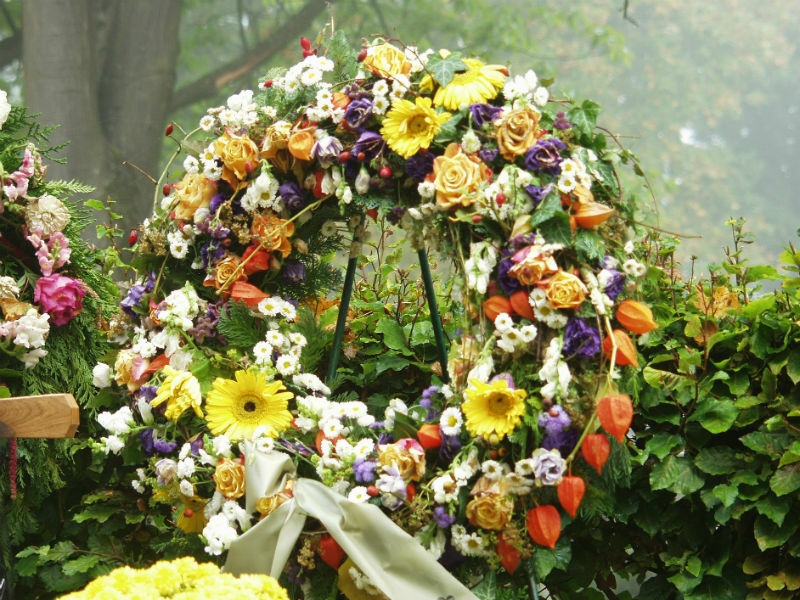 It’s quite common for a funeral to take place a week or more after someone has died. With more and more families living considerable distances apart, many people plan a funeral to give plenty of time and notice, in order that everyone is able to attend. Many crematoria and places of worship have ‘in-demand’ and quieter times of day or week. At many crematoria, Fridays can be a particularly busy day of the week, for instance. Your funeral director will be able to help you arrange a fitting date and time for your loved one’s funeral and reception, while if you are planning a cremation funeral our Crematorium Directory may help you in your search for a suitable funeral venue. If your wish is for your loved one to have a traditional burial or green burial, your funeral director can help you make arrangements for a burial plot, graveside ceremony and funeral service in your chosen cemetery or woodland burial ground. If you wish to repatriate your loved one to another country for their funeral, there are many specialised funeral directors who can help you to arrange this. They will be able to assist you in the same way as any other funeral director, but also help guide you through the legal process of repatriation. Specialist funeral homes like this can also help the bereaved through the complicated paperwork involved in bringing a loved one who has died overseas back to the UK. After someone dies, the funeral home will arrange for their ‘removal’ from the family home or place where they died, to prepare them for their funeral. The people who do this understand that it can be a very difficult time for the person’s family. They do their best to make this process as reassuring as they can for the bereaved and will treat the person who has died with dignity and respect. Modern funeral homes have cold facilities where the person who has died can be looked after until the day of their funeral. This also enables families who wish to visit their loved one to spend precious time with them before the funeral. Some funeral homes have dedicated chapels of rest where families can do this, while many can also arrange for the person who died to spend time at rest before the funeral at their family home or place of worship. For some people, paying their respects like this is an important part of planning a funeral service. Some people appreciate periods of time spent in quiet contemplation with their loved one, while for others, a formal visitation in a chapel of rest gives a wider group of friends and relatives the opportunity to say goodbye. Many funeral directors offer embalming, a chemical procedure which helps temporarily preserve a person’s body and helps restore their appearance. Whether or not you choose embalming or to view your loved one, the funeral director will ensure that they are washed, groomed and carefully dressed in the clothes you select for them to wear for their funeral. When planning a funeral, some people choose for their loved one to be smartly dressed and groomed, while others may follow a loved one’s wish to be buried in a favourite old outfit, or even a superhero costume. A funeral director can liaise with people and organisations that supply goods and services, ranging from coffins, urns for cremation ashes and funeral cars, to flowers, venues and celebrants. There are many kinds of coffins available. Options range from inexpensive cardboard coffins, to traditional coffins in a variety of classic woods, beautiful woven caskets, wool shrouds and bespoke, themed and personalised caskets. A good funeral director should be able to provide a wide variety of choice for your consideration when you are planning a funeral. The funeral director can also discuss funeral transport for mourners and may have their own fleet of funeral cars, or be able to arrange for an alternative kind of hearse. Our helpful articles about planning a funeral service provides much more information other things to consider when you are arranging a funeral. From popular funeral hymns and poems for a funeral, to the many ways in which spirit, faith and individual personality can play an important part in arranging a funeral service. Compare local funeral directors now to begin making funeral arrangements for your loved one.